I’ve temporarily skipped my September report but don’t worry, I’m still reading the book. I snuck ahead to my October read because I couldn’t stand waiting to read the anthology containing my first published story. For my October read I read the 2013 Redlitzer Anthology. 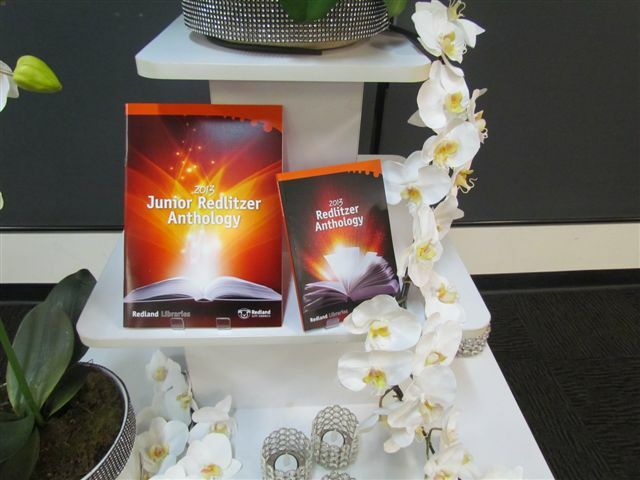 The 2013 Redlitzer Anthology contains nineteen stories all from the shortlisted winners of the 2013 Redlitzer Writing Competition. Nine stories are from the adult category and the other ten are from the teenage category (there was also a junior category, but they were published in a separate anthology). I went into reading the anthology well aware that there would be a broad range of genres and styles since the only thing binding the anthology together (apart from glue obviously) was the fact all the authors are from the same geographical area. Despite that fact there wasn’t a single story in the volume which was disappointing. And I mean it. I’m not saying this because I’m published in there, I genuinely found every story interesting and well written. I honestly expected there to be at least one story that fell short (in my opinion, not overall) as I must confess there was one in the 2012 Redlitzer (which I read as research before submitting)(and no, I won’t tell you which one because it was simply a case of the genre being not my particular style, so it wasn’t the writer’s fault and they don’t deserve to be outed like that), but no, I really did like every single story. There are several stories that fall into the speculative fiction category, meaning I can totally claim this for the challenge ;p . ‘A Royal transformation’ by Madison Birtchnell has a wonderful world and an obvious message, and ‘Loving Arizona’ by Alana Coomer contains a really cool concept which reminds me a little of what I’ve written about in my novel ‘Written By The Stars’. ‘The Host’ by Charlie Schirmer views a world through the dark eyes of an invading entity and does a very cool job. ‘It Was Lonely Being God’ by Sean West is a short but bittersweet tale looking at things from a different perspective. Of course not forgetting my own story ‘Stolen hearts’ where a young woman must track down the man who stole her grandmother’s heart before it’s too late. The remaining stories range from tales of love (and lust in the case of ‘Mates’ by Linda Stevenson) to memoir pieces (like Hazel Barker’s ‘Hunger’) to action and adventure (and robbing the local pub in ‘Go On Three’ by Robbie Milton). The stories by the teenagers rarely read as such, these guys (and gals of course) have some serious talent. On the whole it is a great collection to read and I am seriously so proud to have been a part of it. keep your eyes on this blog, giveaway soon to come!